THE CANADA ARIZONA BUSINESS COUNCIL (CABC) is a 501(C)6 non-profit Arizona Corporation whose sole purpose is to increase bilateral trade and investment (FDI) between Canada and the State of Arizona and we do so by maintaining the highest connections across every major industry. The CABC represents the 350 Canadian companies operating in Arizona and the 150 Arizonan companies operating in Canada, as well as companies that are interested in bilateral relations. The Council is sanctioned by both the State of Arizona and the Canadian Government, with a mission to assist and facilitate through various means and ways, the commercial and social interaction of individuals, companies, and organizations in pursuing cross border relationships to increase business, support trade growth and investments. 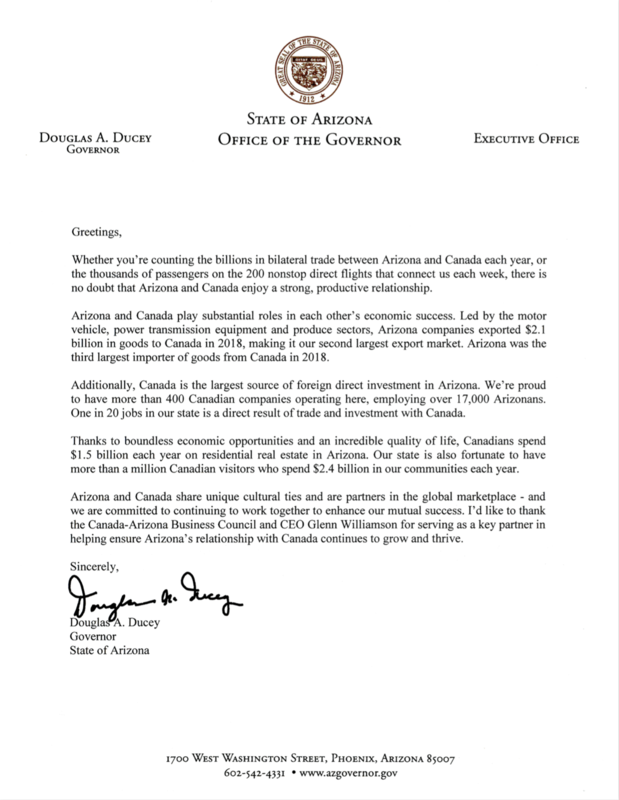 Arizona accounts for approximately $6 Billion bilateral footprint of the $1.4 Trillion between Canada & U.S.
Connect with Arizona and Canada business professionals – Contact Us. © 2013 All Rights Reserved CABC.